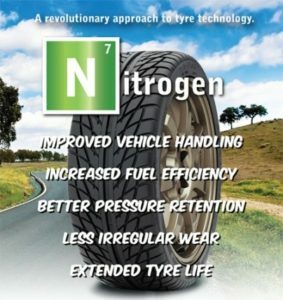 Why should I fill my tires with Nitrogen? Drive with your headlights on, especially on cloudy days when visibility is poor. This will help other drivers see you better. You can get your vehicle moving much better with a slow start on ice and snow than you can by accelerating fast. Slick pavement demands slower speeds than normal. Having good brakes is no aid when the pavement is slick and the tires don’t grip the pavement. Because of diminished traction and treacherous footing, be prepared and have an “out” if something happens up ahead of you. You can do that by simply increasing your following distance. Nitrogen (N2) makes up the majority of the air that we breathe and is colorless, tasteless, and non-toxic. The next most common component of air is oxygen (O2). Together N2 and O2 make up approximately 99% of the air we breathe and traditionally fill tires with. N2 is a larger molecule than O2. Therefore, it cannot escape as easily as oxygen through porous material such as a rubber tire wall. Leaking at a much slower rate than oxygen, a tire filled with a higher percentage of N2 maintains its proper pressure roughly three to four times longer than air-filled tires. Proper inflation provides better fuel economy, superior handling, longer tire life, and increased safety by reducing the likelihood of low pressure related loss of control, blowouts and other tire failures. N2 is a dry, inert gas. O2 in a tire provides unwanted oxidation. Over time, this reaction destroys the tire carcass and corrodes wheels. A tire is prematurely aged by O2 from the inside out as the pressurized air in the tire makes the 02 try to escape through the tire carcass, speeding up the damaging oxidation process. N2 on the other hand, is a harmless inert gas that does not react negatively with tires and wheels. N2 filled tires also reduce tire heat, thereby decreasing rolling resistance and increasing fuel economy. N2 is Non Flammable. O2 is a flammable gas while N2 is an extinguishing gas. N2 has been uesed in tires for many years on aircraft, military vehicles, off road trucks, racecars, and even Tour de France bicycles.